Okay, okay...I'm behind! 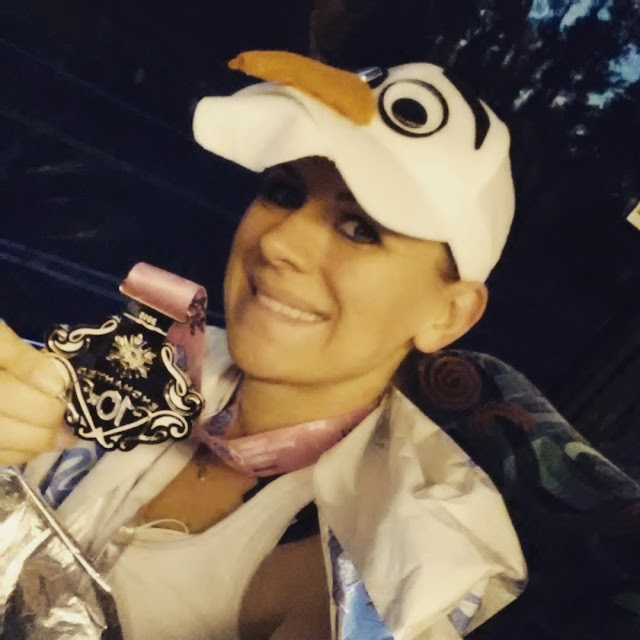 I have had so much excitement going on in my "real life" that my blogging life just got put on hold, but I'm back and I'm ready to finish recapping the 2015 Princess Half Marathon Weekend! If you missed the first two parts, click HERE and HERE. 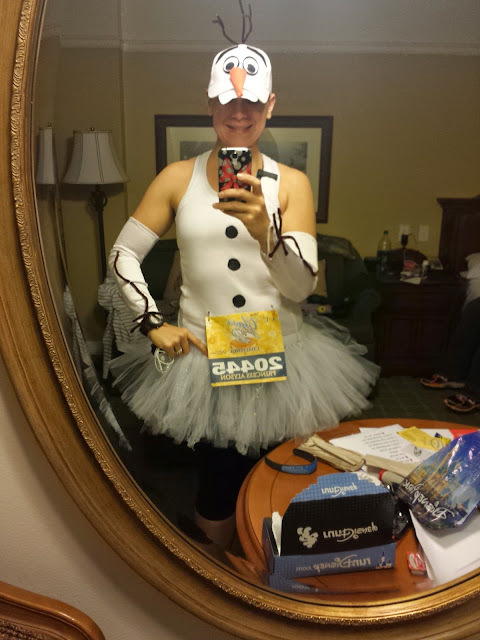 For the 10k, the weather "warmed up" enough for me to sport my recycled Olaf costume. Hey...when you run this many races, you've got to recycle! I still headed to the staging area with a jacket and mylar blanket to keep warm. The morning went similar to the morning before, minus a few shivers. It was still cold, but after the FROZEN 5k, it seemed more manageable today. I handed off my cold weather gear to my hubby and headed to the starting corrals in the same way as the day before. I was in corral A and there was a huge backup of runners trying to get through the small walkway where they were checking bibs. By the time I made it to my corral, they were already escorting runners around the bend to the start line. They also gave the warning to get rid of your mylar blanket before crossing the start or you jeopardize your chip time not being recorded. I didn't want to take any chances, so I tossed my blanket a few seconds before they counted down to the start. Yes, for the record, it was still COLD! The 10k course was similar, if not exactly the same, to the 10k during Marathon Weekend. This means you spend a good amount of time on the streets before seeing the magic of Epcot. It also takes you through the Boardwalk area, which is a great distraction and gave my feet a bit of a break (somehow running on the boardwalk felt different than the road, and it was good to switch it up). I've run this course before during Dopey, but somehow this time it seemed a whole lot more crowded and it was hard for me to get some good speed going. I'm sure some of this had to do with how cold it was and with me starting toward the back of corral A. I just remember getting "stuck" at some areas where I just couldn't push through and had to slow down. I wasn't running for a PR or anything, so I just "Let It Go"! I love the entire Princess Weekend and I DEFINITELY see myself returning in the future. That being said, I will always prefer the Disneyland 10k courses to WDW. You just get more time in the parks in DL. The medal was awesome and I loved all the Princess touches. At the end of the race, I was a little disappointed in the amount of time we had to spend on the bus for the clearing of the streets. If it had been warmer, I probably wouldn't have minded, but seeing as it was so cold, I was more than ready to get into a hot shower! We were staying at Saratoga Springs and weren't able to get to the hotel due to road closures. They did, at least, allow us to stay on the bus in comfy seats while we were waiting. Did you run Princess? Do you prefer DL or WDW 10k courses?